Thomas Stearns Eliot OM (26 September 1888 – 4 January 1965) was an essayist, publisher, playwright, literary and social critic and "one of the twentieth century's major poets." Born in St. Louis, Missouri in the United States, he moved to the United Kingdom in 1914 (at age 25) and was naturalised as a British subject in 1927 at age 39. 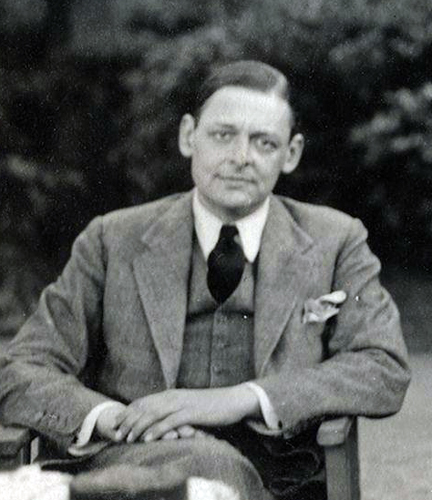 Eliot attracted widespread attention for his poem The Love Song of J. Alfred Prufrock (1915), which is seen as a masterpiece of the Modernist movement. It was followed by some of the best-known poems in the English language, including The Waste Land (1922), The Hollow Men (1925), Ash Wednesday (1930) and Four Quartets (1945). He is also known for his seven plays, particularly Murder in the Cathedral (1935). He was awarded the Nobel Prize in Literature in 1948, "for his outstanding, pioneer contribution to present-day poetry"
T.S. Eliot (1888–1965). Prufrock and Other Observations. 1920.